In the last few days, I have been explaining the roots of a psychological theory called “Attachment Theory.” If you haven’t been following this series, I suggest you read a few blogs back to prepare yourself for the following test. 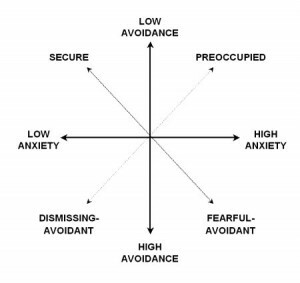 As a reminder, today’s attachment researchers find it helpful to look at the proportion of anxiety and avoidance that we may experience in relation to emotional intimacy. Allow yourself about twenty minutes in total and grab a calculator because scoring is a bit timely. Once you obtain your score, look at the diagram to the left. Estimate where on each vertical and horizontal scale you might fall. Tomorrow, I’ll explain what your score could mean. Enjoy your internal exploration. The statements below concern how you feel in emotionally intimate relationships. Answer the questions in terms of how you generally experience relationships, not just in what is happening in a current relationship. Respond to each statement by giving a number from 1 through 7 to indicate how much you agree or disagree with the statement. 1 = strongly disagree and 7 = strongly agree. At the end of the survey, you will find some slightly complicated scoring instructions. Trust me. You can get through this. Use a calculator. 1. It’s not difficult for me to get close to my partner. 2. I often worry that my partner will not want to stay with me. 3. I often worry that my partner doesn’t really love me. 4. It helps to turn to my romantic partner in times of need. 5. I often wish that my partner’s feelings for me were as strong as my feelings for him or her. 6. I worry a lot about my relationships. 7. I feel comfortable depending on romantic partners. 8. When I show my feelings for romantic partners, I’m afraid they will not feel the same about me. 9. I rarely worry about my partner leaving me. 10. My partner only seems to notice me when I’m angry. 11. I feel comfortable depending on romantic partners. 12. I do not often worry about being abandoned. 13. My romantic partner makes me doubt myself. 14. I find that my partner(s) don’t want to get as close as I would like. 15. I’m afraid that I will lose my partner’s love. 16. My desire to be very close sometimes scares people away. 17. I worry that I won’t measure up to other people. 18. I find it easy to depend on romantic partners. 19. I prefer not to show a partner how I feel deep down. 20. I feel comfortable sharing my private thoughts and feelings with my partner. 21. I worry that romantic partners won’t care about me as much as I care about them. 22. I find it difficult to allow myself to depend on romantic partners. 23. I’m afraid that once a romantic partner gets to know me, he or she won’t like who I really am. 24. I am very comfortable being close to romantic partners. 25. I don’t feel comfortable opening up to romantic partners. 26. I prefer not to be too close to romantic partners. 27. I get uncomfortable when a romantic partner wants to be very close. 28. I find it relatively easy to get close to my partner. 29. I usually discuss my problems and concerns with my partner. 30. I tell my partner just about everything. 31. Sometimes romantic partners change their feelings about me for no apparent reason. 32. When my partner is out of sight, I worry that he or she might become interested in someone else. 33. I am nervous when partners get too close to me. 34. It’s easy for me to be affectionate with my partner. 35. It makes me mad that I don’t get the affection and support I need from my partner. 36. My partner really understands me and my needs. 1. Some answers need to be reverse scored like this: 1=7, 2=6, 3=5, 4=4, 5=3, 6=2, 7=1. Take all the numerical answers to the following questions and give them a new, reversed score: 1, 4, 7, 9, 11, 12, 18, 20, 24, 28, 29, 30, 34, 36. 2. Take the scores to all the following question numbers and average them. These are the questions you should average: 2, 3, 5, 6, 8, 9, 10, 12, 13, 14, 15, 16, 17, 21, 23, 31, 32, 35. In case you’re rusty on third grade math, that means add them all together and divide by the number of answers, in this case, 16. This is your score for attachment-related anxiety. It can range from 1 through 7. The higher the number, the more anxious you are about relationships. 3. Take the scores to the following questions and average them: 1, 4, 7, 11, 18, 19, 20, 22, 24, 25, 26, 27, 28, 29, 30, 33, 34, 36). This score indicates you attachment related avoidance. The higher the score, the more you avoid intimacy in relationships. So, how should I reverse 20, 24, 28… etc? And how should I avarage in the 2nd item? there are 18 numbers. not 16.